legacy systems and permits their continued use without the costly expense of purchasing new imaging systems. with the unsupported and unsecure legacy imaging systems. Supports two (2) networks with two (2) separate Network Interface Cards (NIC) and cabling. Numa’s knowledge and expertise with DICOM and DICOM Modality Worklist. Compatible with modern HIS/RIS and PACS. NumaBridge works automatically in the background and does not require user intervention. The user preforms a DICOM Worklist Query for a list of scheduled patients from the modality tor acquisition station. NumaBridge passes the query from the modality on the isolated network to the HIS/RIS DICOM Modality Worklist (DMWL) provider on hospital network. The results of the Worklist query are returned to the modality on the isolated network. The user selects the current patient and acquires the studies normally. 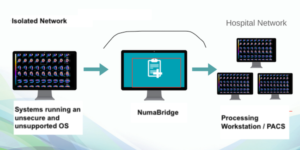 When the studies are complete they may be manually or automatically exported to NumaBridge. 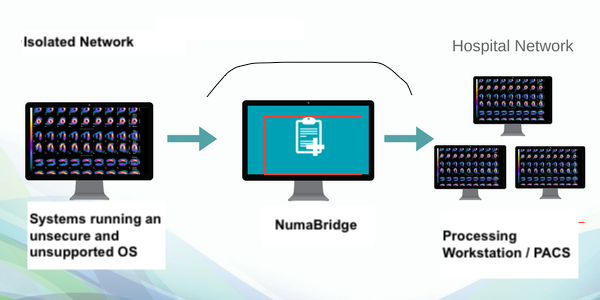 NumaBridge automatically forwards the DICOM studies to the destination system on the hospital network.